Ultra HD Blu-ray: everything you need to know | What Hi-Fi? It took a while to gain momentum, but 4K Ultra HD Blu-ray is now a firm fixture of virtually all major film releases. The first 4K TVs went on sale back in 2012, but it wasn't until 2016 that the first 4K Blu-ray players from Samsung and Panasonic went on sale - alongside, thankfully, an increasing number of 4K Blu-ray discs. Today there are plenty of 4K players on the market, you can pick up a 4K Blu-ray film in your local supermarket - and both are getting more affordable by the day. And with Black Friday on the horizon, now could be the time to get involved. What is the Ultra HD Blu-ray specification? The preliminary spec for 4K discs was revealed at CES 2015, after which the Blu-ray Disc Association made the Ultra HD Blu-ray spec official (along with the name and the logo). The new format supports a resolution of 3840 x 2160, higher frame rates of up to 60fps (frames per second), and high dynamic range (HDR). In physical media, HDR is currently delivered in two main formats: HDR10, HDR10+ and Dolby Vision HDR. That majority of 4K discs come with the standard HDR10. What sets Dolby Vision and HDR10+ apart from HDR10 is the inclusion of dynamic metadata, a proprietary HDR technology that adapts its image frame-by-frame and, theoretically, renders each shot at its best. And what sets HDR10+ apart from Dolby Vision is its lack of licencing cost - TV manufacturers and content studios have to pay Dolby to use Dolby Vision, and have little control over its development and implementation. The first Dolby Vision Blu-ray discs, Universal's Despicable Me 1 and 2, and Sony's Resident Evil: Vendetta, were released in June of 2017. They may not have been the most exciting discs for Dolby Vision's debut, but a start must be made - and there are plenty of new releases with Vision on board. HDR10+ had only Amazon Prime Video promising supported content on its streaming site at first, but we now know that 4K Blu-rays with HDR10+ content are on their way. 4K Blu-rays are encoded using the High Efficiency Video Coding (HEVC) standard (also known as H.265), use 10-bit colour depth and can cover the full spectrum of the Rec.2020 colour space. The discs themselves can be produced in three sizes: 50GB with support for an 82Mbit/s data rate, 66GB with 108Mbit/s and 100GB with 128Mbit/s. What about Ultra HD Blu-ray audio? The UHD Blu-ray specification also includes object-based immersive soundtracks such as Dolby Atmos and DTS:X. Some Blu-ray discs already support these formats, so it's not unique to UHD Blu-ray, but the next-gen audio soundtracks are more prevalent on Ultra HD Blu-ray discs. So far Dolby Atmos has been the prevalent format on 4K disc releases, featuring in films such as Blade Runner: The Final Cut, Deadpool, Wonder Woman and John Wick: Chapter 2. You'll find DTS:X on Despicable Me 1 and 2, as well as the new Harry Potter 4K releases. It's worth noting you won't find Atmos and DTS:X soundtracks on the same disc. It's one or the other. What else does Ultra HD Blu-ray offer? The new discs also support an optional digital bridge feature, which will allow you to copy Ultra HD Blu-ray content to an external hard disk drive, and to portable devices such as smartphones and tablets. The spec also mandates all Ultra HD Blu-ray players be able to play legacy Blu-ray discs. Sadly, 3D isn't featured in the Ultra HD Blu-ray spec - but with LG and Samsung phasing out 3D support in their TVs, and with none of last year's Sony TVs featuring 3D, (let alone this year's), it's perhaps understandable. What Ultra HD Blu-ray players are on sale? Current UHD Blu-ray players can be sorted into two categories: the under-£400 (affordable) models, and the £600-and-above (high-end) players. Cambridge's CXUHD is rather pricey at £700, but it’s shot straight to the top of our list for its excellent picture and sound quality. Rival Oppo UDP-203 remains a five-star player (if you can still find one), and its punchy picture offers a difference balance to Cambridge’s more natural tone. Both offer support for high-resolution audio, giving plenty of choice for audiophiles. And of course there's the upcoming Panasonic DP-UB9000 (£900) and Pioneer UDP-LX500 (£1000) - we can't wait to see how these high-end 4K players pan out. For those that don't want to spend that much, there are more affordable models that offer great performance and value. Our favourite is the Sony UBP-X800 - a five-star player that's an absolute bargain at £330 (down from £400). And the even more affordable UBP-X700 proved its mettle earlier this year. Other models, such as Panasonic's cheaper variants, as well as offerings from LG and Samsung, haven't quite managed to impress us to the same extent. On the games console front, Microsoft's Xbox One S features a UHD Blu-ray disc drive for £300. It was the first console to be compatible with 4K Blu-rays, though be warned, it's not quite up to scratch compared to rival standalone players. The more recent Xbox One X also incorporates a UHD Blu-ray disc player with native 4K, HDR and Dolby Atmos support. It’s pricier at £450, has a more powerful processor to handle 4K gaming and, while dedicated players still win out, is an entertaining performer with 4K HDR discs. As for the PS4 Pro? Surprisingly, Sony chose not to give it the capability, focusing instead on 4K streaming. What Ultra HD Blu-ray discs are on sale? 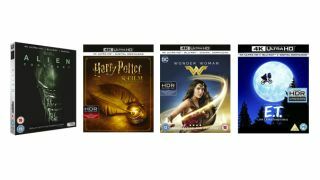 Ultra HD Blu-ray discs are now on sale worldwide and in the UK, with over 100 titles from 20th Century Fox, Sony Pictures and Warner Bros.
Disney has finally joined the ranks, too. Guardians of the Galaxy Vol. 2 was its first 4K disc release in 2017, with Thor: Ragnarok following shortly in 2018. 4K discs currently on sale include BBC's Planet Earth II and Blue Planet II, Blade Runner 2049, Deadpool, Fantastic Beasts and Where to Find Them, Independence Day, IT, John Wick 1 and 2, Kingsman: The Secret Service, Life of Pi, Logan, The Lego Batman Movie, Mad Max: Fury Road, The Martian, Passengers, The Revenant, Sicario, X-Men: Days of Future Past, and X-Men: First Class - to name just a few. Will Ultra HD Blu-ray players play existing Blu-rays? Yes, Ultra HD Blu-ray players are fully backwards-compatible with existing Blu-rays. Ultra HD Blu-ray discs won't play on old players and you can't upgrade old decks, so you will need a new 4K Blu-ray player. When it comes to regional restrictions, the good news is 4K Blu-ray discs have just one region code: worldwide. Essentially, they’re region-free. They can be played on any 4K player, in any part of the world. However, your new UHD Blu-ray player will still have to observe the regional restrictions for DVDs and standard Blu-ray that continue to exist. Most 4K Blu-ray discs come bundled with a standard Blu-ray version of the same film and, so far, the discs we have in our testing rooms seem to be region-free as well. Search for the 'ABC' logo or read the fine print on the box, or look it up online to be sure - especially if you're thinking of importing the latest discs from outside your region. However, it very much depends on the studio, who owns the rights and the distribution of individual films as to whether a Blu-ray has region restrictions or not. We've noticed the major film studios (20th Century Fox, Sony and Warner Bros) are releasing their Blu-rays as region-free, but smaller studios are more likely to have restrictions. What TV do you need for Ultra HD Blu-ray? An Ultra HD Blu-ray player will work with pretty much any TV, but unless it's a 4K Ultra HD TV you won't see the disc's full-fat 4K resolution on screen. If your TV doesn't have the required HEVC codec, the player will downscale the disc's content accordingly. Any 4K TV should deliver a 4K picture, but only TVs with the latest spec will be able to take full advantage of what Ultra HD Blu-rays can offer. This includes HDR, which is increasingly seen as one of the key factors for getting the best possible picture. Most - if not all - 4K TVs on sale now will supports the standard HDR10 spec. When it comes to Dolby Vision and HDR10+, it depends which manufacturer has backed which tech. LG and Sony are your main brands for Dolby Vision, while Samsung and Panasonic are gunning for HDR10+ - although you'll usually find support in the top-end TVs only. While 4K and HDR (or Dolby Vision) aren't necessarily linked technologies, if you're looking for a TV with one, it should ideally have the other in order to get the best picture performance. Look also for a TV bearing the Ultra HD Premium logo - this means it meets certain 4K HDR standards, including support for standard HDR10. However, it doesn't mean the set necessarily supports Dolby Vision HDR. Do you need a new AV receiver for Ultra HD Blu-ray? Yes and no. If your system currently uses an AV receiver to do the HDMI switching,and carry audio/video over HDMI around your system, then this won't work with 4K Blu-ray unless your AV receiver is 4K-compatible. The good news is most home cinema amplifiers released in the last three years have been 4K compatible, from 2015's Award-winning Denon AVR-X2200W to the current Sony STR-DN1080. Look for HDCP 2.2 and HDMI 2.0a in the specifications for a clear indication of 4K compatibility. If your AV receiver isn't 4K-compatible, you will need to run a separate HDMI cable from your Ultra HD Blu-ray player to your screen for 4K video, as well as one from the player to your amplifier for audio - this is why some 4K Blu-ray players have two HDMI outputs. Is Ultra HD Blu-ray worth it? We certainly think so. 4K Blu-ray continues to impress us with its incredibly detailed picture quality, and better hardware and advances in HDR technology have improved performance even further. Ron Martin, VP of Panasonic's Hollywood Lab and a crucial player in the development of Ultra HD Blu-ray, told What Hi-Fi? 4K discs will beat 4K streaming: "[a disc format] is the only repeatable, reliable way to do it. Streaming has certain advantages but many disadvantages." We've compared how 4K streaming stacks up against 4K Blu-rays and standard full HD Blu-rays - and it's no surprise that 4K Blu-ray beats them all. And we're not the only ones to back 4K as the favoured format. Sales of Ultra HD kit is on the rise, with 4K being the main sought-out feature for customers hunting for a new TV. 4K Ultra HD Blu-ray may have taken a while to get going, but it's quickly set the standard for the ultimate home entertainment performance.